‘Wilfred’’s penultimate(ish) episode delivered good amounts of both laughs and darkness as it marches towards the series finale. We’re almost there folks. 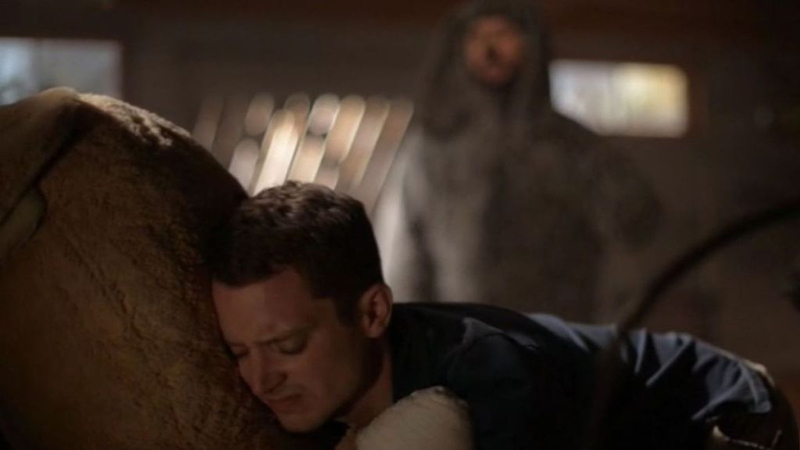 With only the one-hour series finale left in the tank, Wilfred began its endgame this week, and the premise of the final episode is going to be dark, even for Wilfred. But we’ll get to that a little later. Continuing on the hilarious stinger from the last episode, Wilfred had one of his arms/legs run over by a car and is living it up as a three-legged dog. Though Wilfred seems to be enjoying it, the situation is starting to wear on Jenna, who’s already fragile from her divorce and now blaming herself for Wilfred’s accident. She and Ryan got some great moments in the first act, as Jenna tries to reach out to Ryan for support only to have him distance himself from her again. Wilfred wisely points out that Ryan can’t live like this and needs to find a way to confess his feelings for Jenna, but Ryan hilariously points out Wilfred’s in no position to talk about courage as his missing leg has made him afraid to walk up stairs, which also made for some great physical comedy as Wilfred smugly put his arms out to be hoisted up or down stairs by Ryan. Of course, the crux of the episode came when Ryan agreed to take Wilfred to the vet, which revealed his wound had healed, but shook things up even further when it was discovered he has a lump in his lung and might have cancer (I guess all those cigarettes had to catch up with him sometime.) This led to Wilfred doing his bucket list, doing everything from destroying flowers to one of the funniest scenes in the entire series as he came after the Mailman with a baseball bat. There was also the heartbreaking hilarious sequence of Wilfred passing Bear on to a local puppy, who immediately tears her apart as Wilfred walks away sobbing. (Oh Bear, you were too beautiful for this world.) The one variable in all this, though, was Jenna, as Ryan struggled with whether or not he should tell her and risk upsetting her further. This led to Wilfred reiterating his point about courage and Ryan again calling him out on his own cowardice, to which Wilfred responded by, for once, putting his money where his mouth is and going up the stairs. Everything unravels, predictably, when Jenna finds out and scolds Ryan for keeping the information from her. However, she reconciles with him in one of the saddest moments in the series, as she informs Ryan that Wilfred’s test came back positive… and he’s only got days to live. Ryan finally comforts Jenna here, which leads to both them sleeping together and Ryan at last admitting his true feelings for her. Wilfred’s reaction to the news is surprisingly reserved, keeping the third act’s somber tone as Wilfred comes to terms with the coming storm, but does offer a tidbit about how he believes the fact that he brought Ryan and Jenna together meaning he must be Mattdamon, the god the cult spoke of. This was one of the most jam-packed episodes of the entire series, and expertly meshed the darkly comedic tone of the beginning with the sad, somber one of the ending in true Wilfred fashion. As the clock winds down on the series, it’s good to see all the big arcs of the series come to a close (especially Ryan and Jenna, which has been teased since the very first episode). Though it’s a dark note to go out on, I’m more interested than ever to see how Wilfred spends its final days, both the dog and the show. Was this the saddest or the funniest episode of the show? Leave your totally asked-for opinions in the comments below.